In many cases, the way Revoice Pro works will mean you can bring long audio signals into Revoice Pro and not need to edit the waveforms. You can, in effect, create edits by inserting several Process Control Blocks to start and stop at specific points in each track of the input audio waveforms. This is usually the most effective and efficient way of working. There are situations, though, in which it is helpful to edit audio waveforms in Revoice Pro and this section explains the range of waveform editing operations available. Because Revoice Pro supports editing of either the process controls or the waveforms in the same track, sometimes you must switch Revoice Pro from Process Editing to Waveform editing. There are several "one-click" ways to do this. 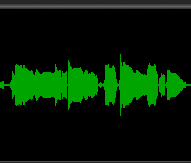 In many cases, a waveform is selected for editing by just LEFT CLICKing it once, and it will be displayed in green (as in image at the right) indicating it is selected. Once a waveform is selected, then two familiar types of editing are available: screen-based and menu-based. Hold down CMD key on keyboard and LEFT CLICK on a selected (green) Process Control Block to de-select that Process. RIGHT CLICK in a waveform area - and if it brings up the menu (shown to right), select Edit Audio to leave Process Editing mode. Either will exit the APT Process Editing mode and turn formerly green Process Control Blocks grey, indicating that mode was successfully turned off. You can then click on waveforms to select and edit them. Positioning the cursor on the start or end of the selected waveform will show the blue "trimming" cursor and then holding down a LEFT CLICK will drag the selected start or end of the waveform. In Revoice Pro, waveforms are allowed to overlap (as shown in image to the right) and both will be played at the same time and processed as one signal. If no process has been assigned to a waveform, a RIGHT CLICK on a selected waveform will pop up the waveform editing options window, shown to the right for macOS. 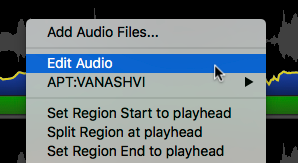 If you have positioned the Playhead at a useful point before bringing up this window, then the three (self-describing) menu options can be used either to shift the selected waveform's start or end, or split it into regions. A further group of "standard" menu options allow the entire selected waveform to be Cut, Copied, Deleted or (if a prior operation copied a waveform and "Paste Audio ..." is not greyed out), the copied waveform can be Pasted to start at the Playhead. 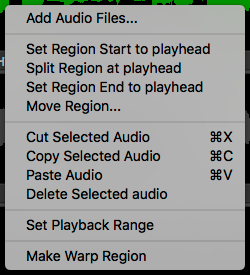 If an APT or Doubler Process uses the selected audio waveform, the menu will have two additional options below "Add Audio Files...". The menu displays as shown below if audio is already selected (waveform is green), or if neither the audio or process is selected (both grey). If the process is currently selected (process bar is green) the menu displays as shown in the section below (macOS). 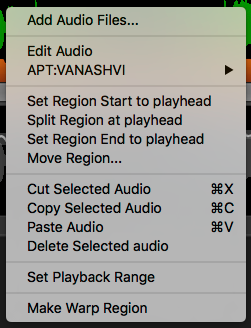 If the audio is already selected (green), selecting Edit Audio will deselect it. If the audio is not selected, then this will deselect a selected process and select the audio instead. The next item in the menu, in this case "APT:dub unprocessed", shows the currently selected process and can be selected to switch to editing process-based items (such as Energy or Pitch).